My worst run as Fiorentina manager appears to be over – and with Christmas fast approaching, it’s just as well. As I stated last time out, I tested out a few tactical tweaks for our home matches against Salernitana and Pescara. We won both games by narrow margins, and although some tweaks didn’t seem to work, others seem to have made a difference. One of the biggest changes I’ve made over recent weeks is that we’re now playing a slightly more direct game and focussing our play down the right flank. Federico Chiesa is our outstanding attacking talent, and he is more effective as a right-winger than an inside-forward. In order to get the best out of Chiesa, I had to make alterations to my 4-2-3-1. The ball-winning midfielder has been replaced with a deep-lying playmaker, which should make us more defensively solid as well as more expansive. That of course meant I needed to do away with the advanced playmaker. I’m no tactical mastermind like a certain Mr Hobson, and I can’t explain tactics anything like as eloquently, but even I know that having two playmakers leads to confusion. So that’s how we lined up against Pescara. You’ll also notice that I did away with the Control Possession tactical style and rebuilt the system from scratch. Don’t read too much into the starting mentality, as I switch between Balanced and Positive based on the calibre of our opponents. There’s no more faffing around with ball-playing defenders; the goalie instead distributes to the wing-backs across all our systems. In addition, Alban Lafont has become confident enough with the ball at his feet that I will now use him as a sweeper keeper. I’ll mainly use the 4-2-3-1 Wide away from home, or against defensive opponents at the Franchi. My 4-1-2-2-1/4-3-3 system – which I call ‘Fullerball’ – remains our primary home tactic for the time being, but that’ll also receive some TLC over the coming weeks. The counter-attacking variant has been pretty much binned off. Our first match of this chapter was our last in the Europa League Group Stage. With our place in the first knockout round secured, I could afford to leave most of my key men at home when we travelled to Belgium for a dead rubber against Charleroi. Backup goalkeeper Daniele Padelli made his long-awaited Fiorentina debut in this match. 18-year-old Primavera left-winger Niccolò Pierozzi – whose twin brother Edoardo was also in our youth set-up as a right-back – was given his first competitive senior appearance. The match itself was about as poor as you would expect. Both goalkeepers had to make a save in the opening minutes but saw very little action thereafter. From our perspective, Domenico Berardi offered very little attacking threat, with only one of his six shots being on target. There were no parties for him that night. While the first half was generally even, Charleroi had the better of the second, and only some excellent Fiorentina defending kept them off the scoreboard. I was also impressed by our midfield substitute Tommaso Minocci – another 18-year-old with an apparently bright future. He was one of very few players to show full commitment in a tame goalless draw. So yeah… that’s all I’ve got. Want some trivia to fill time? England played at the Stade du Pays de Charleroi twice during the Euro 2000 group stage. They beat Germany 1-0, only to undo their good work by losing 3-2 to Romania and crashing out. Cheers, Phil Neville. One English team that was enjoying their European exploits was Everton. A 2-1 home win against Galatasaray ensured that they topped Group B by a comfortable six points, which belied their mediocre domestic form. Indeed, Marco Silva would be sacked just three days later, after a 3-0 loss at Chelsea left Everton 13th in the Premier League. Rumours that Silva had held secret talks with Arsenal about potentially replacing Unai Emery have thus far not been proven. Verona – just like Salernitana and Pescara – had taken to Serie A football surprisingly well so far. Thanks largely to a nine-match unbeaten run over the autumn, the Mastini occupied a lower-mid-table spot and looked like they would be tricky customers at the Marcantonio Bentegodi. They also had Portugal’s Euro 2016 hero Éder leading the line for them. Going by the first half-hour, though, it seemed that Verona needed to worry about our attack. There was a series of near-misses from Viola players – most notably Riccardo Saponara, whose 25th-minute header clipped the post. Close wasn’t good enough for me, though, so I demanded that my players upped the tempo and really took the game to that opponents. Within five minutes, Federico Chiesa had made the breakthrough with an excellent back-post delivery to Pellegri, whose header put us 1-0 up. Another header from a right-wing cross delivery eight minutes later would send us into the break with a two-goal advantage. This time, it was wing-back Almamy Touré who supplied the ammunition for Valentin Eysseric to claim his fifth goal of the season. The first deadly duo would link up again in the 52nd minute. Verona’s defenders looked utterly clueless as another cross from Chiesa went over their heads and was planted into their net by Pellegri’s. The hosts’ misery was compounded a little over a minute later. Right-back Alessandro Crescenzi missed his interception from another Chiesa special, and a volley from Eysseric completed our vice-captain’s treble of assists. 4-0 to the Viola! Neither Pellegri nor Eysseric could upgrade their braces into hat-tricks, but there was no need for them to. With Verona’s tragic team only managing two shots on target (both of which were caught by Lafont), our third straight Serie A victory was as easy as it came. I even found time to give Pierozzi another taste of senior action. We were now up to 8th, having overtaken Lazio after they fought out a goalless draw with derby rivals and fellow underachievers Roma. That result continued Roma’s terrible run of form and led to Vincenzo Montella’s dismissal as head coach, just six months after he’d replaced Eusebio Di Francesco. We were also breathing down the necks of Torino in the last provisional Europa League place. Guess who our next league opponents were? Milan’s incredible start showed no sign of stopping, even though Sampdoria restricted them to just a single goal. Napoli had earlier kept the pressure on the Rossoneri by beating Cagliari 2-1. Inter joined their city foes in the top three by sweeping past Genoa 4-1, and a 3-0 win at Bologna restored Juventus’ Champions League placing. I’ll take that. 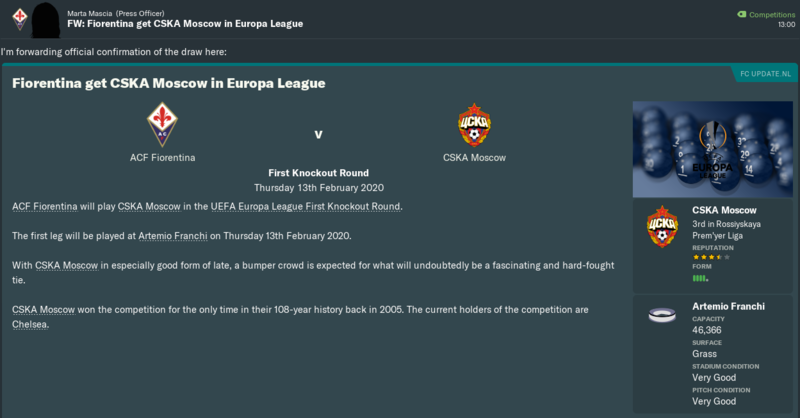 CSKA Moscow comfortably topped their group (which also included Werder Bremen, Legia Warszawa and Red Star Belgrade) with five wins out of six, but I’m not too worried about them. While any top-end Russian team deserves respect, I’d like to think our strike force will ultimately have too much for Igor Akinfeev and company. The Europa League would come back into focus for us in February. Before then, we could concentrate on another cup competition. 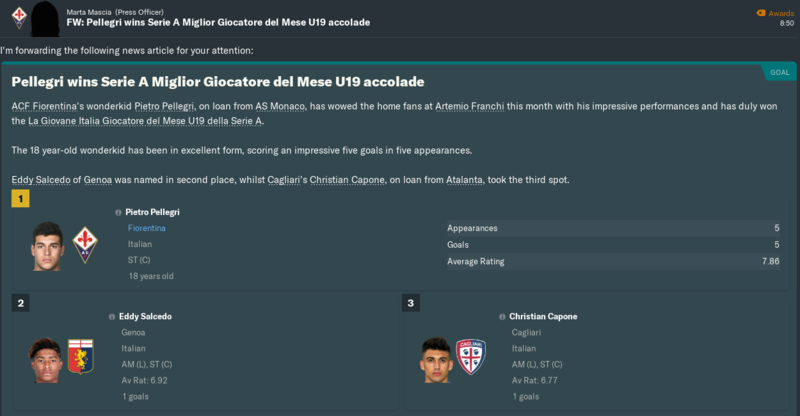 Our first match in this season’s Coppa Italia was up against Sassuolo, who had whitewashed Cittadella 5-0 a fortnight earlier in the final qualifying round. Sassuolo were on course to win promotion back to Serie A at the first attempt, so I expected them to make life rather difficult for us. Dusan Vlahovic could’ve put them on the back foot in the ninth minute, but his header from Chiesa’s cross clipped the bar. Another effort five minutes later found its way into Andrea Consigli’s hands. Those were just two of countless attempts we had on the Neroverdi goal in the first half. Eysseric arguably came closest to scoring after 22 minutes, with a swerving shot that barely missed the far post. The early stages of the second period were rather tense, with our only attempt on goal being a skyward effort from Riccardo Saponara. Shortly after that, I made my first two substitutions. Young playmaker Sandro Tonali was struggling with a knock, and I didn’t want to risk breaking Chiesa, so they were respectively replaced with Marco Benassi and Berardi. The tide started to turn after those changes. After 65 minutes, Lafont pulled off two saves in quick succession from Alfred Duncan and Andrea Pinamonti to prevent Sassuolo from edging ahead. Two minutes later, our French number 1 made heavier work of an angled attempt from winger Antonino Ragusa, needing two attempts to secure it. At the other end, Berardi’s first outing against his old team was not going to plan, as Consigli tipped over the enigmatic forward’s close-range attempt in the 73rd minute. I later replaced the disappointing Vlahovic with Pellegri up front, but extra-time was still looming large. Then history repeated itself. A couple of clumsy challenges on Pinamonti and Duncan saw Bryan Dabo collect two bookings either side of the 90-minute mark, and the Burkinabe midfielder was dismissed. You’ll remember that a late red card had been our undoing in last season’s Coppa Italia, so part of me was understandably concerned. Unlike last time, though, we didn’t sit back during the additional 30 minutes. We continued to take the game to Sassuolo in extra-time, and the introduction of Touré as a fourth substitute would make all the difference. Just over two minutes into the second extra half, he supplied Pellegri with a silky cross that our boy wonder headed home to break the visitors’ resistance, not to mention their hearts. We were now into the Quarter Finals, where Atalanta halted our charge last season. La Dea await us again in the last eight following a surprise 2-0 win at Roma… but this time around, we have home advantage. The match will take place on the day after New Year’s Day. We returned to league action at home to Torino, whom we would replace in the top seven with victory at the Franchi. Walter Mazzarri’s team were bidding to qualify for Europe after three straight 9th-place finishes, and their charge had been bolstered by the loan signings of Ross Barkley and Danny Welbeck. Both were faring rather better in Turin than fellow Englishman Joe Hart had three seasons back. Barkley was booked two minutes in for upending Christian Nørgaard, and he would be seething again another couple of minutes later. Nørgaard’s square pass was threaded first-time into the Torino area by Maximiliano Olivera for Chiesa to clinically cut home. There were some doubts about whether Federico was offside, but VAR confirmed that a Torino defender was marginally keeping him onside. Il Toro’s first shot on target came on 25 minutes. Welbeck’s byline cross to strike partner Simone Zaza – who, contrary to what West Ham fans will say, is actually rather prolific – was headed into Lafont’s grateful hands. Alban would be more severely tested by another header seven minutes later, this time from centre-half Kevin Bonifazi. Those attempts were clear warnings, but we didn’t listen. When Lorenzo De Silvestri leapt above Chiesa to get his noggin to a corner from fellow wing-back Riza Durmisi, Lafont could only watch it sail past his despairing dive. Our lead had been erased four minutes into the second half, and things could well have worsened six minutes later. Set-pieces are like kryptonite to us, and so it proved again when Durmisi curled a free-kick into our box from the left. Welbeck flicked it to the far post for Barkley to finish, but the England duo were left stunned when VAR adjudged the latter to be offside. What a huge let-off that was for us. Barkley tried his luck again in the 76th minute, but his drive from the edge of the area barely made Lafont sweat. He would be replaced late on by one-time Italy midfielder Daniele Baselli, who had Torino’s last match-winning opportunity in injury time. Luckily, Lafont saved his spot-kick to secure us a share of the points. Despite missing an opportunity to get back into the top seven, I was quite satisified with how this weekend had gone. So too was Cristiano Ronaldo, whose hat-trick inspired Juventus to a 4-1 pasting of a pitiful Empoli side who’d won their first match of the seaon only a week earlier. Napoli slipped up and drew 0-0 with Genoa, but they at least stayed unbeaten in Serie A. Milan could not, with two goals at the San Siro from Lazio’s Marco Parolo and Luis Alberto finally halting the red-and-black charge! Our Boxing Day bout was at the Dacia Arena against Udinese, who sat in 12th position after a mediocre first half to the season. I was pleased to learn that Valon Behrami was no longer around, having been shipped off to Granada in the summer. If I was a betting man, I’d place money on him being at Watford by February. Anyone who’d placed a few Euro on a goal in the very first minute would’ve been quids in. Chiesa tormented Udinese on the right wing, dribbling almost half the length of the pitch before crossing for Eysseric to head us into a very early lead! We looked for another goal in the 10th minute, when Saponara’s first-time ball into the box was struck on the volley by Dabo. The ball almost deflected in off Hidde ter Avest, but Udinese goalkeeper Juan Musso reacted quickly to spare his Dutch right-back’s blushes. Though Saponara hurt his calf later on, that didn’t stop us taking control of proceedings. Following a few close calls, we stretched our lead to 2-0 two minutes before half-time. Vlahovic’s first Serie A assist was a fine lofted ball for Chiesa, who breezed past Angelo Ogbonna and drove in a devastating finish from a tight angle. Our attackers couldn’t quite put Udinese to bed in the second half, not that it really mattered. The Zebrette rarely showed their teeth on the attack, with on-loan Liverpool forward Harry Wilson having a particularly tough time of things. Chiesa’s only black mark in another dominant display was for pushing Rolando Mandragora and gifted Udinese a penalty in the last minute of normal time. Ignacio Pussetto could have restored some home pride… but his spot-kick was one of the worst I’d ever seen, lifted straight into Lafont’s hands! Alban had his seventh league clean sheet this season, and we had our seventh win. There was no post-Christmas cheer for Milan, who lost the city derby by two goals to Inter. They also lost the outright Serie A lead, courtesy of Lorenzo Insigne’s double for still-unbeaten Napoli against a Roma side who’d now failed to win in seven league games. 3rd-placed Juventus were comfortable 2-0 winners at Chievo, while Sampdoria stayed just behind them following a rather less straightforward 3-1 victory against Salernitana. More importantly to us, Torino’s goalless draw with Verona meant we replaced them in the top seven. 48 hours after beating Udinese, we returned to the Franchi for a potentially significant match in our reinvigorated Champions League charge. Stefano Pioli’s Sampdoria arrived in Florence sitting in 4th place, though we would move to within three points of them if we won. Chiesa and Eysseric got well-earned rests, which meant Berardi and Luciano Vietto featured on the flanks to accompany Pellegri up front. In the 17th minute, Berardi played an incisive ball through the Samp backline to pick out Pellegri. The teen sensation then slotted in the opening goal, with French centre-half Timothée Kolodziejczak’s attempted slide tackle only helping the ball past his keeper Esteban. Another Sampdoria player with Polish heritage would fare rather better five minutes later. A vicious low 20-yard drive from right-back Bartosz Bereszynski left Lafont flat-footed – and our lead in ruins – before we had a chance to settle back down. Bereszynski’s opposite number would swing the game back in our favour after 34 minutes. Berardi found the overlapping run of Kevin Diks, who drilled the ball across goal for Pellegri to bury a second goal into the net from close range. Though Esteban denied Pietro a first-half hat-trick, it wouldn’t be long before the 18-year-old etched his signature onto the match ball. A powerful finish from Benedetti’s through-ball in the 50th minute made it three and easy for Pellegri! We kept the pressure on Sampdoria by sending Eysseric on for the final half-hour, though Chiesa remained in reserve. Also coming off the Viola bench later on was Dabo, who secured the win seven minutes from time. Berardi’s cut-back was driven home first-time by Dabo from the ‘D’, capping a delightful display from Fiorentina! This defeat – combined with André Gomes’ late penalty at Atalanta – knocked Sampdoria out of the top four, to be replaced with Inter. Juventus’ grip on 3rd place tightened after Ronaldo’s 12th goal of the season accounted for Parma. Milan’s slump continued when they lost their top-of-the-table meeting with Napoli 3-0 – a result that sent the Partenopei three points clear. Pellegri’s treble capped off an excellent December for the on-loan Monaco hotshot, who had caught fire after a stuttering start to his Fiorentina career. He would cap off the month by being named Serie A’s Under-19s Player of the Month, not to mention the European Golden Boy! The next chapter of this story will take you through the start of 2020. There’s a Coppa Italia Quarter Final, a couple of mid-season friendlies, and then three Serie A fixtures against Lazio, Inter and Napoli to look forward to. Oh yes, and there might also be some transfer business to attend to. 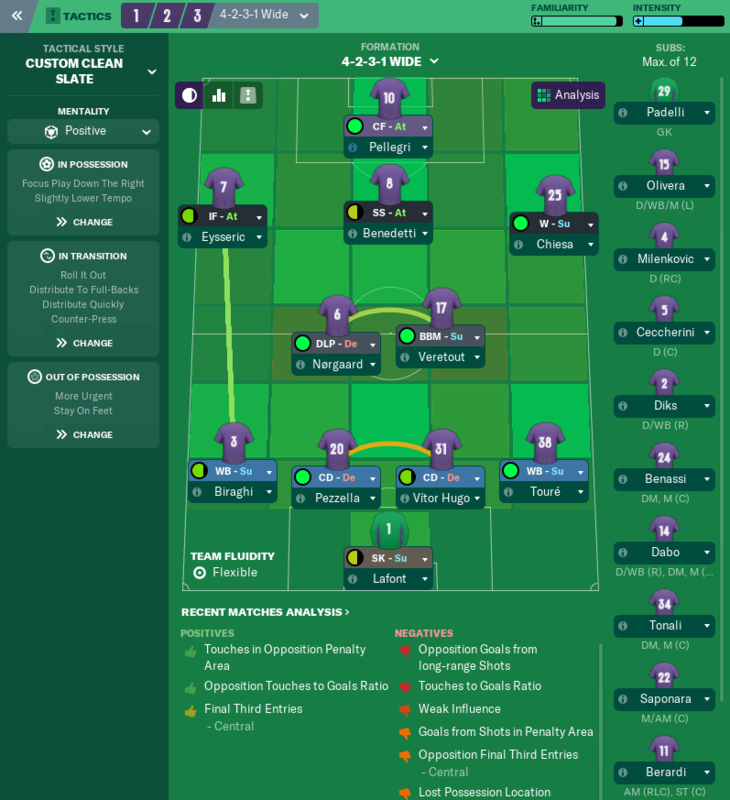 This entry was posted in FM19, Shades of Deep Purple and tagged Fiorentina, FM19, Football Manager 2019 on 15 November 2018 by Chris Fuller. Excellent you have definitely turned things around 🇮🇹 Pellegri is looking good and I am looking forward to the next update to see if you bring anybody in during the transfer window.